From a routine oil change to brakes, tires and tune-ups (and everything in between), trust ServiceMAXX for all your auto repair and maintenance needs. ServiceMAXX can perform factory recommended and routine car maintenance on virtually every make and model. 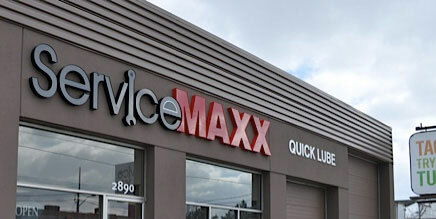 Whether your car's manufacturer's warranty has recently expired and you're looking for an alternative to premium-priced dealership services or you're maintaining an older car, ServiceMAXX trained repair technicians can help keep your car in shape. When you have auto maintenance performed at ServiceMAXX, we'll also provide you with a written report showing the results of our ServiceMAXX Courtesy Check a multi-point visual inspection of your car's major systems under the hood and under the car, as well as a tire check. This visual inspection can help identify upcoming maintenance needs that will keep you off the shoulder and on the road. At ServiceMAXX our certified technicians have the latest diagnostic equipment and know-how to solve your car's problems. For any car repair problem, including common issues listed below, ServiceMAXX is your one-stop shop for expert service provided at a fair price by professional staff. Questions? Ask One Of Our Technicians! Your vehicle is one of the most important possessions to maintain for safety's sake. Regular services, such as oil changes and filter replacements, will go a long way to keeping your car in working order, but there must be a time where one part or another out of the hundreds within your vehicle will cease to function. When you need auto service and parts in the Leamington area but want to ensure the work and equipment is dependable, come to AutoMAXX. We perform a full range of auto repairs and services and utilize certified used parts in our replacement jobs. These parts are guaranteed to function just as well as new auto parts while costing a whole lot less. This means your next repair job may be a lot more affordable than you first expected. Check out our ServiceMAXX total car care centre for an estimate on your repairs, or for answers to any questions you may have about our work.